Some 25 years ago the BBC-B 8-bit 32Kb microcomputer was top of the line when it came to computing. Revolutionary games like ELITE set the standard for the early 3D gaming era. Nowadays the entire BBC-B computer can be emulated in a JAVA applet run from your browser. 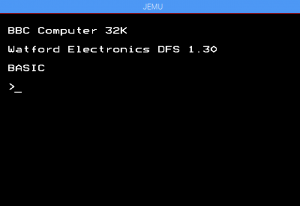 Enjoy this version of JEMU the JAVA based emulator. Read the manuals below to get started. Below you will find the Netbeans 7 source code for the JEMU Emulator (only the BBC-B to keep the filesize smaller) as well as some manuals that you need to get started with the BBC-B & Elite!